Today's post marks the comeback of Pinays Guide posts. Remember when I used to write an informative post on a particular topic either about makeup or skincare?! Well this post is just like that. 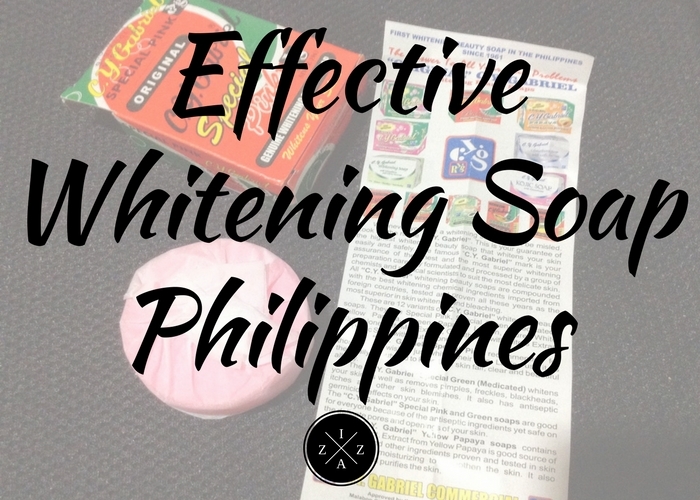 Our topic will All About Effective Whitening Soaps in the Philippines. Why do I use whitening soaps? Before I begin to reveal a list of effective whitening soaps available in the Philippines that I have tried I'd like to give you a little background about my skin type. I have childhood scars on my legs and some on my arms. Because of that I grew up very insecure to wear shorts and show my legs in public. The only option I know at the moment is to whiten to get whiter. I don't consider myself adik when it comes to pagpapa-puti. If you watch my latest YouTube video you'll know that I still consider myself morena. Even in choosing foundation or selecting clothes, I don't distinguish myself as part of the mestizas. I am not stick to one when it comes to whitening soaps because my skin tends to get used to the soap easily. Mabilis mahiyang, after one use hindi ko na nakikita yung effect niya. And I may be this is the reason why I don't get white fast. Haha. I am not in a hurry to whiten my skin. I'm more of the slowly but surely person when it comes to whitening my skin. Finally nagawa ko ng mag-shorts in public!!! 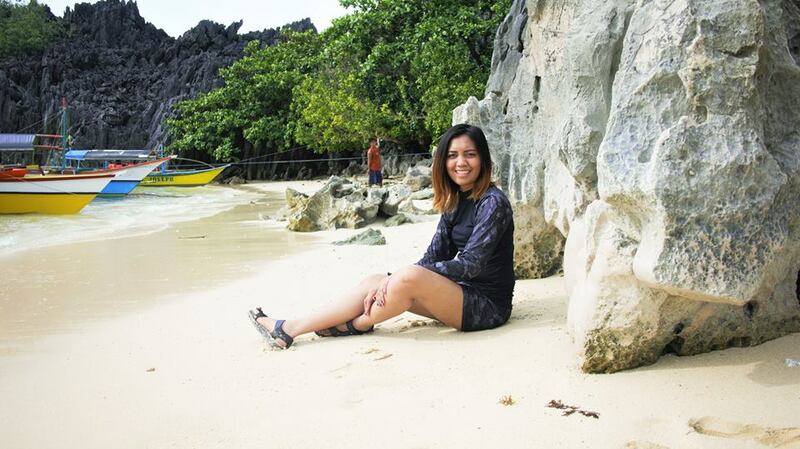 Taken during My Caramoan Trip. What is an effective whitening soap for me? People around me notice the change/s. Alam niyo yung ibang tao yung nakakapansin na pumuputi ka? This is my number one criteria when considering effective whitening soaps. Can lessen my childhood scars, new scars and dark spots. Doesn't cause me back acne. Gives me brighter complexion especially under the heat of the sun. Whitens my skin in a healthy, non-drying way. Now that I've enumerited the reasons why I use whitening soaps and what makes a whitening soap effective for me, it is time for me to share how I would normally use any whitening soap. First, I use Kyusoku Bihaku Korean Magic Towel Exfoliating Scrub as body loofa to apply any whitening soap on my skin except CY Gabriel Soap (reason will be revealed below). You can read my review here before buying in any Watsons near you. What it does is make sure that all the dead skins are being scrubbed away from your body. Medyo masakit to sa umpisa but in the long run you will feel comfortable with it just like any regular body scrub. Second, even if I don't have the luxury of time in the morning, I still make sure to let the soap stay with me for 1 to 2 minutes. I believe whatever ingredients and magic a whitening soap can get absorbed by the skin easily so I make sure to leave it on a little before rinsing. This technique will make your whitening soap more effective. Third, every other night I will have a pampering night routine and instead of using whitening soap I use milk salt like the one from Abonne Spa Milk Salt Shower Formula or Asian Secrets Lulur Body Scrub. Lastly, whatever whitening soap I am using on my body, I also apply on my face during shower. Naging habit ko na to. Then I proceed to my usual skincare routine afterwards. The soaps I will mention below are not in any particular order. I did give my rating for each of them with 5 being the highest (most effective for me) and 1 being the lowest (least effective for me). The list below will be updated from time to time to share my thoughts on other effective whitening soaps out in the market. This is one of the earlier whitening soap I used because it is very affordable. Although the packaging looks cheap and doubtful, I assure you that this soap is effective. My review about CY Gabriel Papaya Soap in Special Pink is one of the most viewed posts here on the blog. It goes to show how interested others are in this whitening soap. This soap gives instant whiter skin upon use and as in mapapansin mo talaga. The soap is rose-scented which is amazing and you'll love how it forms into a creamy foam upon application. Because this is a bleaching soap I don't use my Kyusoku Bihaku Korean Magic Towel Exfoliating Scrub for it. Instead I use a normal towel to lather on my skin. I make sure that the soap forms into a creamy foam first before applying to my body in circular motion. Upon release in the market I immediately bought the Belo Intensive Whitening Soap to try. Lo and behold this soap works! The word "intensive" comes from the two main ingredients of the soap, Kojic Acid and Tranexamic Acid. Which didn't caused me any irritation or allergic reaction at all. The only problem I have with this soap is that it dries my skin so much. I need to apply lots of lotion after application to bring back the moisture on my body. Overall I still consider is one of the effective whitening soap available in the Philippines. It even works faster than CY Gabriel in Special Pink. You can see the effect after use agad. This is another whitening soap I've used ever since college days pa. I remember how famous this soap is on forums and well-recommended by others as well. In my experience the whitening effect is matagal. I hardly notice na pumuputi ako. But I'm happy though because it didn't cause any breakout or back acne which other users had experienced. What I love about this soap most is the squeaky clean feeling. I feel really fresh and clean after using it. This soap also became a big hit on the blog. I used this around last year and made the cut on my July 2016 Favorites and My Current Complete Day and Night Skincare post. 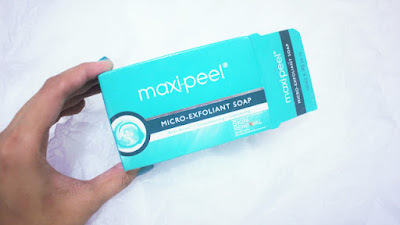 Unlike any other effective whitening soap mentioned in this post Maxipeel Exfoliant Soap has micro beads around it. This is also the only whitening soap that made my skin feel tighter too. I also love the smell of this soap and squeaky clean feeling after every wash. I think that only downside I can share to you is the fact that I experienced minimal allergic reaction on me. I had tiny rashes on my legs in arms. Thus, I only use this soap every other day before and night time only. Please read my full review here. The above are most effective whitening soaps based on my experience. They are also the soaps I rotate in my skincare routine. My number 1 suggestion is to moisturize a lot especially at night when you skin undergoes regeneration. Also keep away from harmful rays of the sun. Try to pick up a lotion with SPF. I will be updating this post if I ever I used a new effective whitening soap. Soap your way to a fairer and flawless skin. Check out these amazing soaps that are surely effective. Try it now and see the difference. Where can I buy the cy gabriel soap?